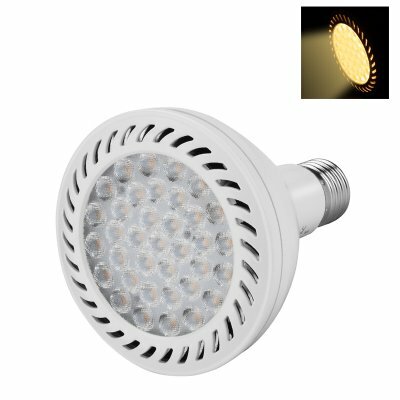 Successfully Added E27 LED Spotlight PAR30Y 36W - 3200 Lumen, E27 Fitting, 2800 to 3200K, 50000 Hours to your Shopping Cart. Start saving money right away by switching to LED lights. Be pro green and do your bit for the environment while saving money it's a win-win! LED lighting is the best way of illuminating your rooms and this energy efficient spotlight uses a fraction of the power of incandescent or compact fluorescent lamps (CFL) bulbs. Add to that their long life span, and eco friendly components and you have a winning solution to all your home lighting. Light up your home or business with this 36 Watt LED bulb suitable for E27 fittings. With its 3200 lumens of light between 2800 and 3200K this LED bulb gives of a warm and inviting hue that's suitable for ambient lighting in living rooms or relaxed areas such as hotel lounges, bars and restaurants. This LED spot light is made up of 36 individual bulbs and has a 25 degree beam angle. With a life expectancy of 50000 hours or more this bulb will be saving you money and the environment for over 5 years paying you back handsomely for your investment. This E27 LED Spotlight PAR30Y 36W comes with a 12 months warranty, brought to you by the leader in electronic devices as well as wholesale LED lights..